Inside a graffiti-strewn loft building on a quiet Bushwick street lies the hub of a worldwide mania. It’s the headquarters of ConsenSys, a three-year-old firm that’s the brains behind Ethereum. It’s the most popular cryptocurrency this side of Bitcoin, and last year its value soared by nearly 9,000%, from $8 a unit to $723. The world’s supply of Ether, the creators’ preferred term for the currency that everyone else calls Ethereum, recently was worth about $120 billion*—twice the market value of Bank of New York Mellon, founded by Alexander Hamilton in 1784. The ConsenSys nerve center is a tech version of Willy Wonka’s chocolate factory, with computer programmers spread throughout four rooms on two floors cooking up new ways to promulgate Ethereum. The building is also residential, so a sign reminds the 100 staffers to keep the noise down and not disturb sleeping babies. With luck, the kids are deep sleepers because brigades of investors have been marching through the hallways at a steady clip, hoping to team up with the hippest company in finance as it adds staff, opens global offices and expands into consulting, asset management and venture capital. Ethereum is essentially a private payment network, like PayPal, where parties agree to pay for things using the cryptocurrency. For example, a customer dining at a participating restaurant that can be debited for the meal over the platform. There’s no credit card involved, so the restaurant can dispense with cashiers—and bank processing fees. Multiply scenarios like that by millions and you can start to understand why some people think Ethereum could be the next big thing. Enthusiasm is so high, Miley asked that the company’s address be kept secret, for fear that people who have made big bets on its currency will decide to make pilgrimages. “There are a fair number of crazies out there,” she said. With a frenzy not seen since the dot-com boom, New York is in the midst of an investment craze. It seems as if just about everyone knows someone with a tale from the crypto. While the current run will likely end with a painful crash —last week the currencies fell — scores of young entrepreneurs are busy using the blockchain technology that powers Bitcoin, Ethereum and other cryptocurrencies to build new businesses. And they are starting to drag a somewhat wary financial establishment along with them. “Of course it’s a bubble,” Ethereum co-founder Joe Lubin declared in October, speaking about the skyrocketing value of the nearly 1,500 cryptocurrencies trading on various markets. “Hopefully it’s one in a series of increasingly larger bubbles.” His candid assessment did nothing to dampen enthusiasm: Ethereum’s market value has since quadrupled, even after it fell 30% from its $1,389 peak in the past month. Morgan Hill, a hedge fund manager who specializes in cryptocurrencies, agrees there’s a bubble. Not that he’s complaining. His firm’s investment of a few thousand dollars in Ethereum and other crytpocurrencies early last year netted him $5 million. He sold the last of it last month, but Hill’s phone is constantly buzzing with calls from investors the world over looking to ride his crypto coattails by joining his fund, which he reckons will have about $15 million under management by the end of this month. Hill is attracting international investors eager to ride his coattails. BLOCKCHAIN The technology underpinning Bitcoin, Ethereum and other digital currencies is essentially a ledger system that records transactions electronically. These ledger entries are sorted into blocks that are chained together so that they can be tracked over time. The ledger is protected by cryptography, which makes it difficult (but not impossible) for outsiders to modify or hack it. The system is sufficiently robust that millions of users now trust blockchain to record financial transactions. That trust is the basis of Bitcoin’s value. MINING The process of adding and validating new entries on the blockchain. It requires solving a complex math puzzle for which Bitcoin miners are paid 12.5 Bitcoins, or roughly $125,000, every time they succeed. The process is called mining because the coins were created at Bitcoin’s inception, when the total inventory was capped at 22 million. To date, 17 million Bitcoins have been “dug up.” Other cryptocurrencies have no limit on how many coins can circulate. WALLET A digital account where users store digital currencies. Wallets are protected by a password or a string of characters, but if the holder forgets or loses it, access to the currency inside is lost, as if it were cash. MARKETPLACES There are hundreds of cryptocurrency exchanges, with CoinBase and Bitstamp among the most popular. It’s also possible to make deals directly with other traders via platforms such as BitQuick and BitBargain. Any profits from cryptotrading must be reported to the IRS, which considers the coins property, and thus subject to capital gains taxes. TRADING LINGO To “hodl” means to hold Bitcoin—the term’s origins trace back to a typo on a Bitcoin web forum. “Fiat,” typically used derisively by Bitcoin aficionados, describes any government-issued currency. “#BTFD” stands for “buy the f—ing dip,” and it is usually employed by hodlers desperate to find someone willing to use fiat to buy a coin as it is losing value. —A.E. Ethereum’s story began in Jamaica. Lubin, a former midlevel Goldman Sachs executive who had built a business representing musicians, was on the island with a client when he read a white paper about how Ethereum would work. He got in touch with the paper’s author, Vitalik Buterin, now 24 years old, and in 2015 set up shop in Brooklyn. Cryptocurrencies have been around since 2009, when the elusive figure known as Satoshi Nakamoto mined the first block of Bitcoin, then went public by linking to a British newspaper article forecasting a second U.K. bank bailout. The first Bitcoin bubble hit four years later, and a much bigger one blew up last year, driven at least in part by South Koreans’ worries that a nuclear bomb might obliterate the nation’s banks. Ethereum was the first digital currency firm to take hold in New York, where many business power brokers remain highly skeptical of the entire enterprise. The most prominent critic is JPMorgan Chase CEO Jamie Dimon, who last year called Bitcoin a “fraud” and later said it has “no actual value.” One reason Dimon may feel that way is some investors are now using credit cards and even mortgaging their homes to buy Bitcoin. So if the currency plunges, there could be widespread defaults that sap the earnings of his bank and others. Still, the city’s financial establishment is grudgingly adapting. A Bitcoin futures market is now open, and the New York Stock Exchange’s owner recently said it is preparing to share Bitcoin trading prices with institutional investors. “My job is to get that shiny new toy—Bitcoin—on our network,” one trading executive said. protected electronic ledger of continuously maintained and verified transactions shared by users on computer servers. Blockchain does have potentially useful applications for big databases, which explains why JPMorgan, despite Dimon’s dismissals of Bitcoin, is using the technology to help process certain global payments. Microsoft uses the Ethereum platform to help track supply chains. As a business proposition, blockchain is still in its infancy and enduring plenty of growing pains. Late last year, traffic on Ethereum slowed considerably after an app called CryptoKitties debuted and gained a huge following among Asian teenagers. They were taken with the cartoon cats, whose unique “cattributes” were useful for verifying Ethereum transactions. Though it disrupted trading, Miley said the craze helped introduce scores of new users to Ethereum. Only six cryptocurrency companies are licensed to do business in New York, and consulting firm Blockchain Driven estimated in December that just 932 people in the city work for blockchain-related businesses. But Blockchain Driven also said “it is fair to assume” that number will rise to 10,000 by 2027. That might sound like more irrational exuberance, but money is pouring in. Venture capitalists invested a record $1 billion in crypto startups last year, according to Pitchbook. Flatiron District–based Chainalysis, which specializes in tracking Bitcoin transactions for financial institutions and law enforcement, has 60 employees and is looking to hire 40 more in the coming months, a spokeswoman said. Chronicled launched in 2014 as a blockchain company verifying the authenticity of sneakers and handbags, and uses the technology to track pharmaceuticals. The firm now wants to expand into food and use blockchain to track items such as lobsters from fishing boats to restaurants. Of course, cryptomania has little to do with improving the financial world’s plumbing. Instead, it’s largely seen as the magic formula that allows anyone with enough computing power to become a modern-day alchemist turning code into currency beyond any government’s control. Michael Leung certainly admires blockchain technology. But he’s really most interested in how rich it might make him after investing 10% of his net worth in Bitcoin during the summer. “Bitcoin is all anyone can talk about at work,” said the 29-year-old accountant from Bay Ridge. For now Leung is happy because he got in when a single Bitcoin was worth $3,000, roughly a third of its current value. Of course, he was a lot happier early last month, when it was trading around $20,000. After a recent four-week plunge dropped Bitcoin to under $9,000, Leung was looking for a little boost, so he joined a blockchain meet-up at eBay’s office in Chelsea. Leung brought along his sister Megan, 26, who works in social-media marketing and has also caught the Bitcoin bug. “It’s like an addiction,” she said. The meet-up’s emcee, Blockchain Driven senior adviser Art Malkov, opened by touting the potential of blockchain and asked how many in the audience of 200 were involved in Bitcoin a year ago. Ten hands went up. When ConsenSys employee Jack Spallone inquired, “How many of you would be particularly interested in this topic if there was no financial incentive?” hardly anyone stirred. Wall Street trader Peter Borovykh later forecast that OPEC would one day demand oil be paid for in Bitcoin instead of dollars so it could “kill” the U.S. shale and gas industry. It’s a weighty expectation, considering that all the cryptocurrencies combined are worth $425 billion, about $400 billion less than Apple. One of the biggest obstacles facing cryptocurencies is the difficulty of spending them, in large part because their underlying values are so volatile. But another is a product of the craze itself: So much traffic is clogging Bitcoin’s network that its transaction fees have hit $10 or more, and trades take an average of 25 hours to confirm, according to blockchain.info. LOCAL PROPHETS: Nicholas and Burrell preach the upside of New York Coin. A solution, at least to the latter problem, just may have been found by pub owner Alex Nicholas and attorney James Burrell. The two are promoting New York Coin, a cryptocurrency that has been mostly dormant since it was created in 2014. 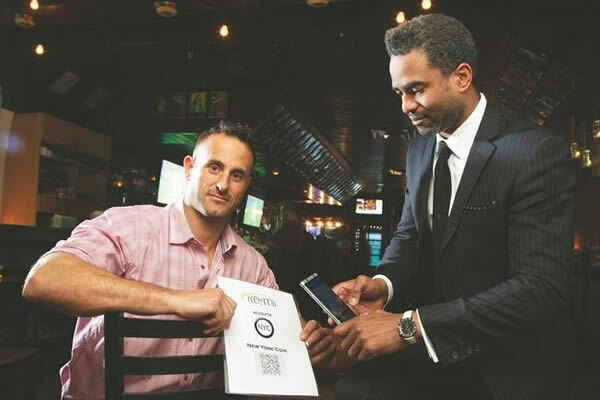 On the third Wednesday of every month, they hold court at Keats, a Midtown bar Nicholas owns, to preach the benefits of the coin, which they say is faster and less expensive to use than Bitcoin. To prove their point, Burrell used New York Coin to buy a Bud Light, and the transaction was confirmed in about 30 seconds, much to the delight of the crowd of 20 who came to the meet-up. In the coming weeks, the coin’s advocates plan to rent a storefront, preferably in SoHo, so passers-by can learn more about its benefits. Heading into last week, only Nicholas’ bar and a gym he owns accepted New York Coin, but its backers announced on Twitter that a Manhattan restaurant and a Brooklyn recording studio would soon take it. The tweet was hashtagged #real. *All valuations of Ethereum and other cryptocurrencies are as of press time. Correction: Chronicled launched as a blockchain company in 2014. This fact was misstated in an earlier version of this article, originally published online Feb. 5, 2018. A version of this article appears in the February 5, 2018, print issue of Crain’s New York Business.